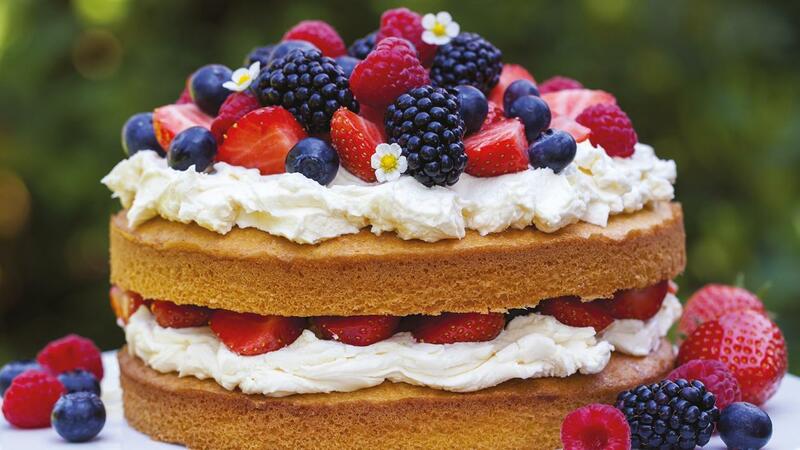 A simple sponge cake topped with fresh berries and cream makes a great centre piece for any summer occasion. Your guests will love this delicious and simple summer berry cake as much as you. Cream together the STORK with the caster sugar until light in colour. Slowly add in the eggs a little at a time making sure they are fully incorporated into the mixture. Add in the self raising flour and the vanilla extract making sure it is mixed through. Then add the milk and beat in. Split the mix between 2 cake tins. Bake the mix at 160°C for 15 -20 min. or until a skewer is inserted and comes out clean. Whisk the MEADOWLAND Double until firm peaks are formed. Fold through the icing sugar. Cut half the strawberries in to thick slices. Then cut the remaining strawberries in half. Place the bottom layer of the cake onto a cake board. Add on a third of the whipped MEADOWLAND and top with the thick sliced strawberries. Add on the second sponge cake. Add the remaining MEADOWLAND Double on top but don't spread to the edge of the cake. Allow to chill then add the remaining strawberries, raspberries, blackberries and blueberries to garnish.